Lev Haiba is determined to become Nekoma High's ace volleyball player, but can barely hit the ball. The team's coach orders Kenma Kozume to help out Lev with his practice, much to the former's annoyance. 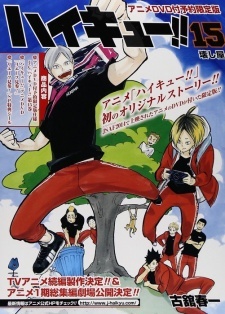 However, as they continue to work together, Kenma realizes that Lev's height might actually be able to help in games if his skills are honed in the right way. The event anime will tell an original story that reveals "a surprising side of a popular player." Note: The OVA was screened at Jump Festa 2014 on November 9, 2014. It was later bundled with the 15th volume of the manga.